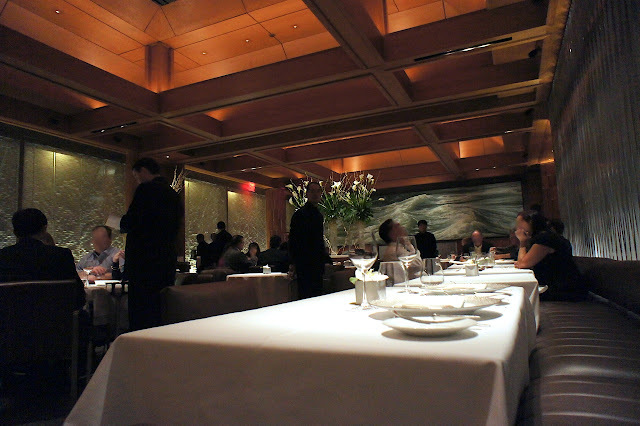 Le Bernardin is a very highly regarded three Michelin star restaurant just off Broadway in New York City, and is regarded by some as one of New York's finest. Owned and run by Chef Eric Ripert, it specializes in seafood only (though in the menu there is an option to make a special request for an order of red meat). Having been here once in 2009, it has since undergone a renovation and we were keen to see what the new interior looked like, having remembered that the old one was quite dated. One of the wonderful things about dining in New York is the fact that restaurants take seatings late in the evenings, like in our case, 10.30pm. This allowed us to have dinner after attending a Broadway show or concert (it was the latter in our case, at the Lincoln Centre just a short walk away). We were given a rather small table at the corner, and the restaurant was packed (it was a Friday night). The crowd that Friday night was dripping in moolah. A group which came just after us left behind 2 bodyguards at the bar (it was interesting watching the restaurant serve food to these bodyguards who ate it at the bar; we always wondered what kind of food was served in these situations) and another group was opening bottles of Cheval Blanc and Haut Brion (even though these wines really didn't go with their seafood courses). After an incredibly filling lunch at Eleven Madison Park on the same day, we wisely chose to skip the tasting menu and go instead for the prix fixe menu of four courses which included the dessert. The wine list was quite good (but expensive) and against the sommelier's better judgement I chose a 1995 Gevrey Chambertin which, as it turned out as the sommelier had predicted, was quite earthy (I was feeling stubborn that night for some reason and was not in a mood to hear out the sommelier's recommendations, which in hindsight I should have). Although a white wine would be a more natural fit with our seafood meal, as it turned out the Burgundy went quite well with two of my dishes which had foie gras and mushrooms. 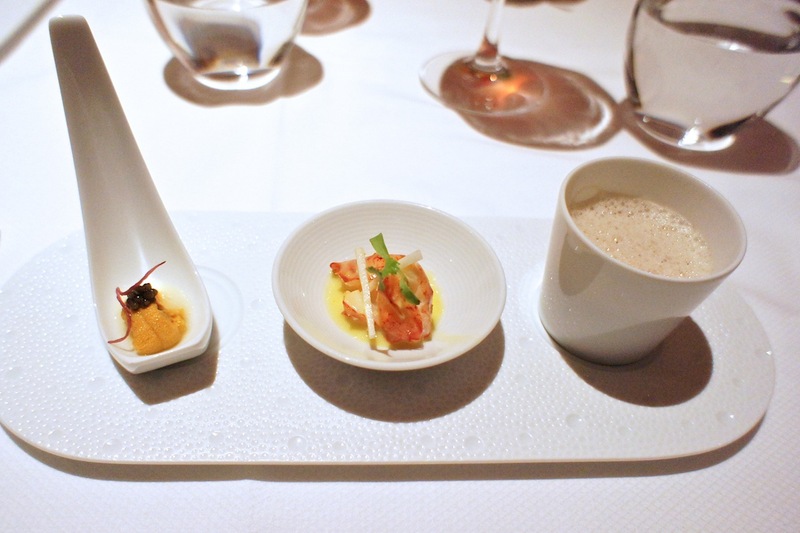 Disappointingly, a rather ordinary trio of amuse bouche of raw sea urchin (with a pinch of caviar), butter poached lobster meat and a small cup of cappuccino bisque was served. We expected more from a restaurant of this standing. 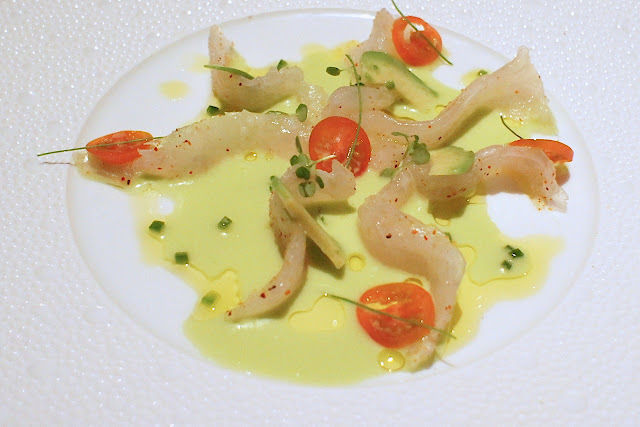 Fluke - "Sashimi" of fluke, micro watercress, avocado, jalapeño-lime broth: this was light and fresh but was otherwise quite underwhelming, as the jalapeño-lime broth did not lift the dish as was expected to. Tuna - Layers of thinly pounded yellowfin tuna, foie gras and toasted baguette, shaved chives and extra virgin olive oil: this was a exquisite tuna pounded into a thin layer covering a very thin piece of toasted bread spread with foie gras. It was what I had and loved during my last meal here and was every bit as good again this time. It was simply done yet very delicious. Lobster - butter poached lobster tail, spiced celeriac, earl grey-citrus sauce: The lobster was very nice, but the sour sauce (with earl grey flavour which was barely noticeable) was slightly puzzling. 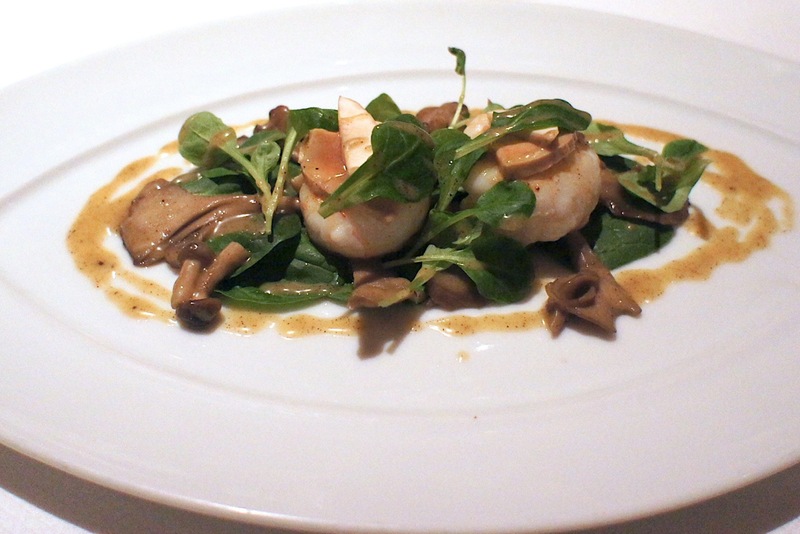 Langoustine - seared langoustine, mache, wild mushroom salad, shaved foie gras, white balsamic vinaigrette: Another very good dish, the langoustines were sweet and fresh and together with the mushrooms and foie gras shavings, brought to mind the flavours of both the land and the sea. 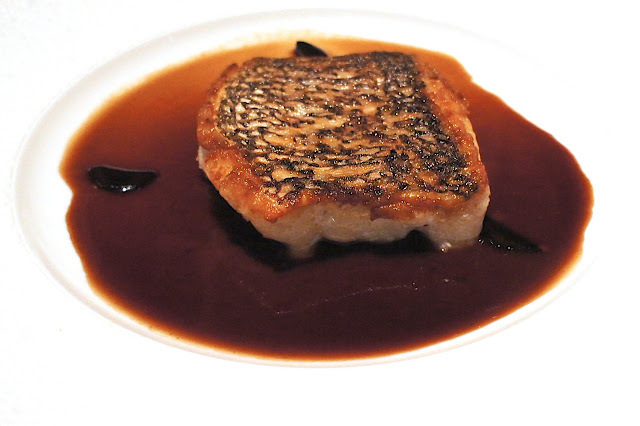 Black Bass - crispy black bass, pickled cucumbers, black garlic-persian lime sauce: this was my wife's favourite dish of the evening. The sea bass was nicely grilled with crispy skin and the dark sauce was rich with a taste which was distinctively Asian. 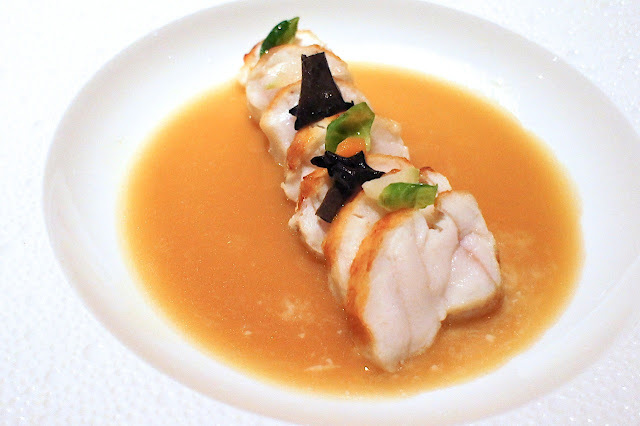 Monkfish - toasted monkfish, brussels sprouts, mushroom custard, pata negra emulsion: This was wonderfully cooked. At the right doneness and texture, this was drizzled with an interesting para negra (spanish ham) clear sauce which gave it the savoury taste. I didn't feel that the mushroom custard or brussels sprouts were significant enough to add to the dish, and that the flavours of both could have been further magnified by having their portions increased relative to the rest of the dish. 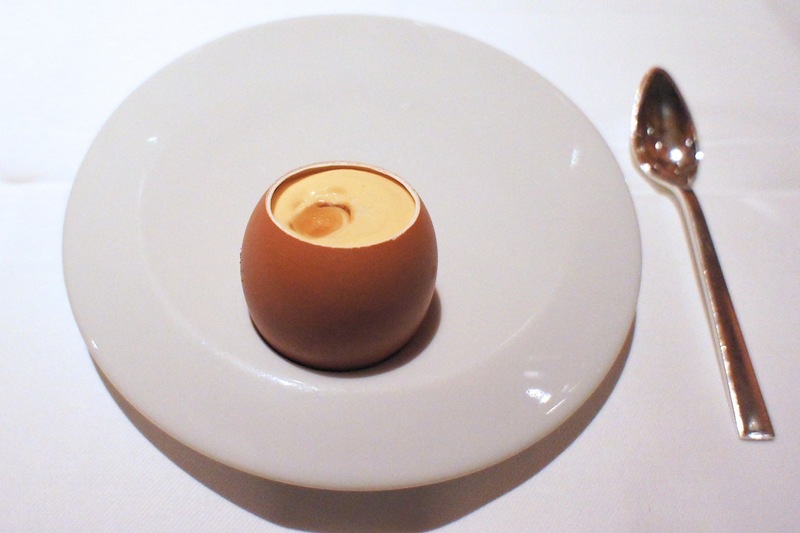 Pre-dessert was a refreshing custard in an egg-shell. 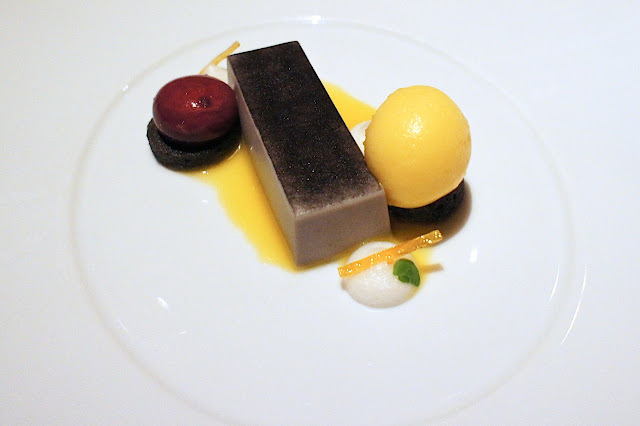 Black Sesame - black sesame panna cotta, sour cherry sphere, mandarin sorbet: Individually they were all very nice but somehow my wife did not get why they were all on the same plate. The sour cherry sorbet, good as it was, couldn't go with the black sesame panna cotta, for example. 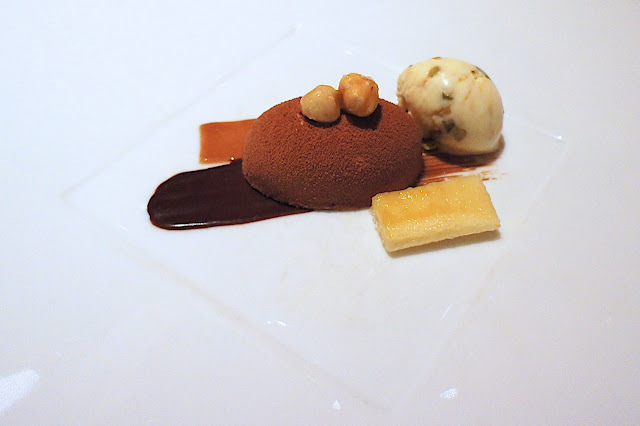 Gianduja - milk chocolate-hazelnut mousse, caramelized banana, burnt honey-pistachio ice cream: I enjoyed the mousse but felt that the banana was sorely out of place (it was lukewarm and seemed to basic alongside the other parts of this dish). 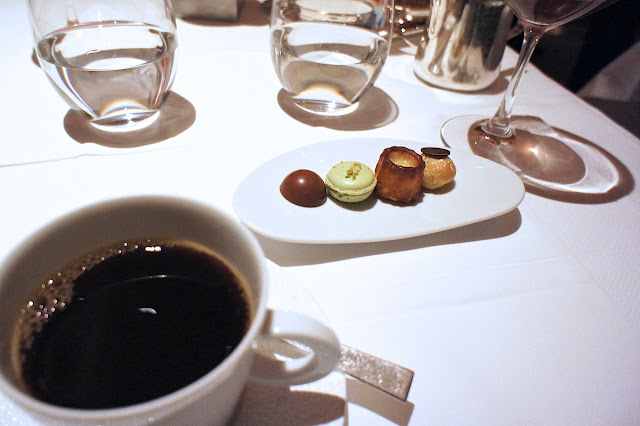 The petit fours were as unremarkable as the amuse bouches. Final Thoughts: There wasn't anything really wrong with any of the dishes, and the seafood in each of them was excellently prepared. However, we felt that there was something lacking in the dishes and in the meal as a whole which we have come to expect from restaurants of this standing. 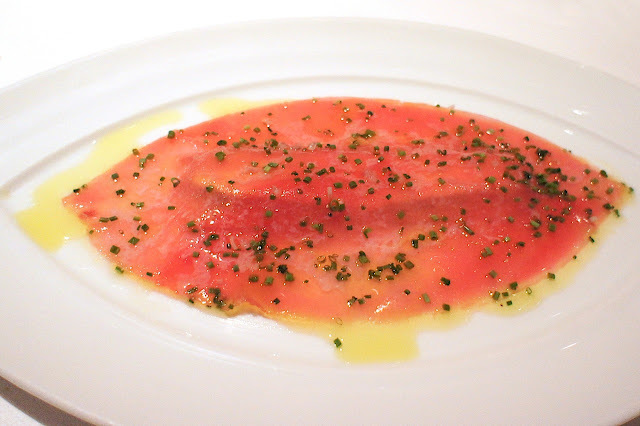 It just felt too 'simple', yet lacking in the panache needed for the meal to have stood out. We had a similar impression during our last meal here in 2009 but at that time we attributed it to our jet lag having just flown in from Singapore the day before. We were slightly disappointed this time that our impressions hadn't changed. 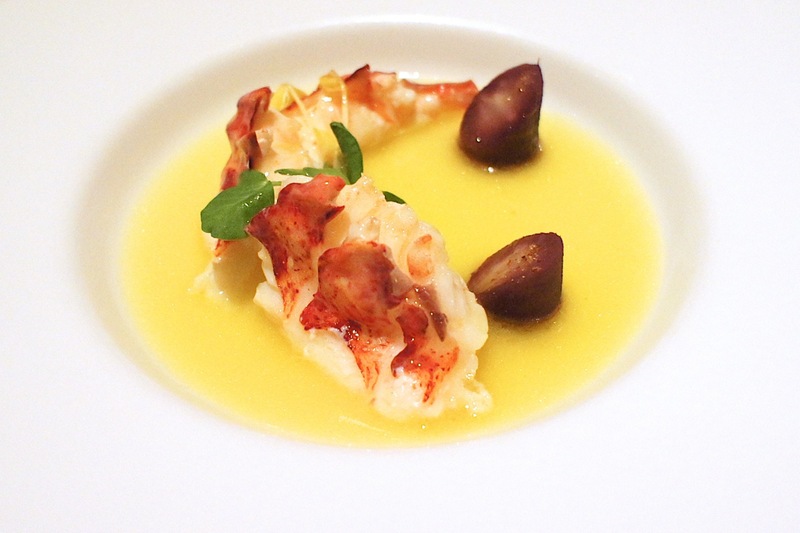 In many ways, comparing like for like, we preferred our seafood meal at Marea. Service was good but not as friendly as the other similar places in the city and it felt too 'moneyed' and stuffy for our liking (it could have been because it was a Friday night). Or maybe our impressions of our dinner here was simply relative to, and suffered as a result of, the fantastic meal we had at Eleven Madison Park earlier that day. Excellent account of your meal with good photographs. 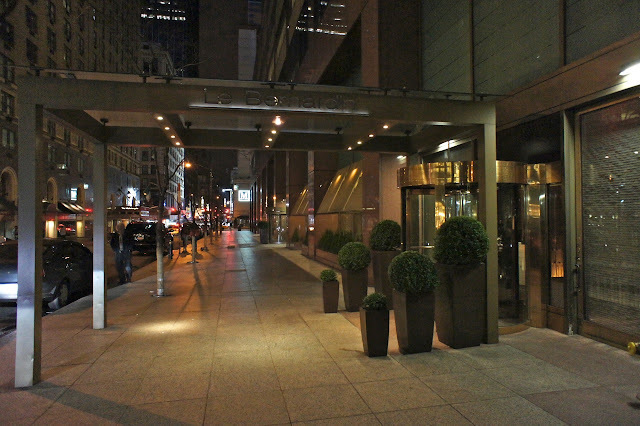 For years , I've been swayed by NYT's reviews of Le Bernardin but some select reviewers , including Andy Hayler and yourself, do not agree with the restaurant's supposed creme de la creme status - which I tend to understand after going through many other accounts as well. One online commentator did not even want to get inside after being out off by a reportedly curt maitre d' !